While conquering Greece and Macedonia the Romans defeated an intervention by the Seleucid Empire, the most powerful of the Hellenistic states founded by Alexander the Great's successors. Soon Roman armies crossed to Asia for the first time to carry the war to the Seleucids. Here they faced one of the most sophisticated armies of the ancient world, evolved from Alexander's all-conquering war machine with the exotic additions of elephants, scythed chariots and heavily armored cataphract cavalry. The Seleucids also possessed a formidable navy. The Roman army defeated the Seleucids at the epic battle of Magnesia in 190 BC, which marked the beginning of a long decline for Seleucid power in Asia . This, however, allowed other states to come to the fore, most notably Pontus . In the 1st century BC, Rome 's grip on its Asian provinces was shattered by the onslaught of Mithridates VI of Pontus, Rome 's most enduring foe. Mithridates was eventually overcome, after many Roman reverses, but these wars in turn led to conflict with Armenia . Like the other volumes in this series, this book gives a clear narrative of the course of these wars, explaining how the Roman war machine coped with formidable new foes and the challenges of unfamiliar terrain and climate. 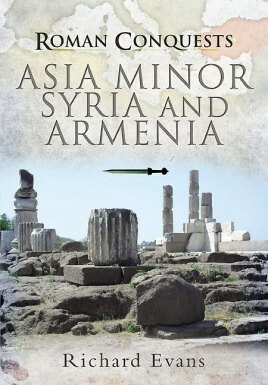 This volume draws on Dr. Evans' expertise in studying topography in relation to ancient events and specifically his original research into the battlefield of Magnesia.